Experienced facilitators guide your people through a practical session using your 'live' topics without any previous training or creative thinking experience required for instant results. 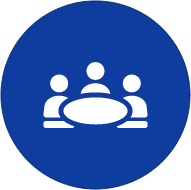 Facilitation is about helping the group to have an efficient and inclusive meeting. It combines a series of roles and tasks. These are often embodied in one person - the facilitator. 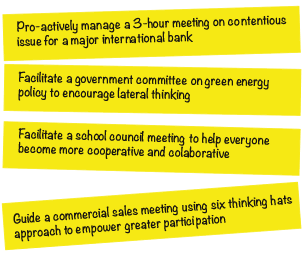 Using the de Bono thinking methods, your facilitator will ensure your meeting is collaborative using parallel and constructive thinking techniques which will help everyone in the meeting to feel included, able to contribute and valued.